Is Arista Networks Inc (ANET) A Good Stock To Buy? Before we spend days researching a stock idea we’d like to take a look at how hedge funds and billionaire investors recently traded that stock. S&P 500 Index returned about 7.6% during the last 12 months ending November 21, 2016. Most investors don’t notice that less than 49% of the stocks in the index outperformed the index. This means you (or a monkey throwing a dart) have less than an even chance of beating the market by randomly picking a stock. On the other hand, the top 30 mid-cap stocks among the best performing hedge funds had an average return of 18% during the same period. Hedge funds had bad stock picks like everyone else. We are sure you have read about their worst picks, like Valeant, in the media over the past year. So, taking cues from hedge funds isn’t a foolproof strategy, but it seems to work on average. In this article, we will take a look at what hedge funds think about Arista Networks Inc (NYSE:ANET) . Hedge fund interest in Arista Networks Inc (NYSE:ANET) shares was flat during the third quarter. This is usually a negative indicator. 17 hedge funds that we track owned the stock on September 30, same as on June 30. The level and the change in hedge fund popularity aren’t the only variables you need to analyze to decipher hedge funds’ perspectives. A stock may witness a boost in popularity but it may still be less popular than similarly priced stocks. 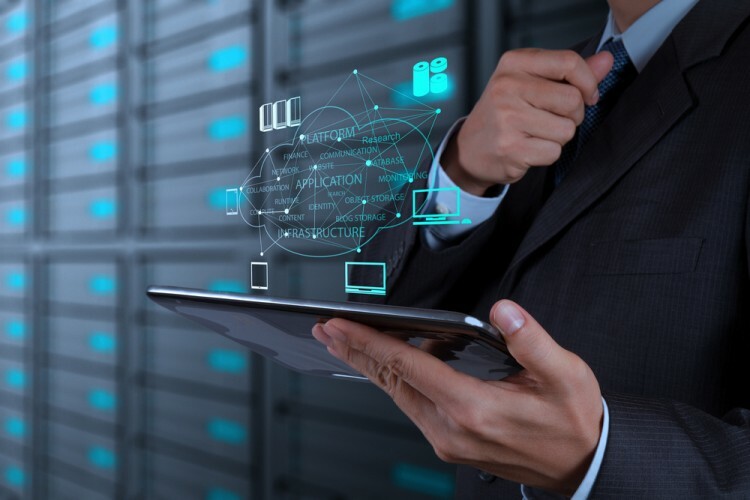 That’s why at the end of this article we will examine companies such as Dun & Bradstreet Corp (NYSE:DNB), Healthcare Trust Of America Inc (NYSE:HTA), and First American Financial Corp (NYSE:FAF) to gather more data points. How are hedge funds trading Arista Networks Inc (NYSE:ANET)? At the end of the third quarter, a total of 17 of the hedge funds tracked by Insider Monkey held long positions in this stock, unchanged from the previous quarter. 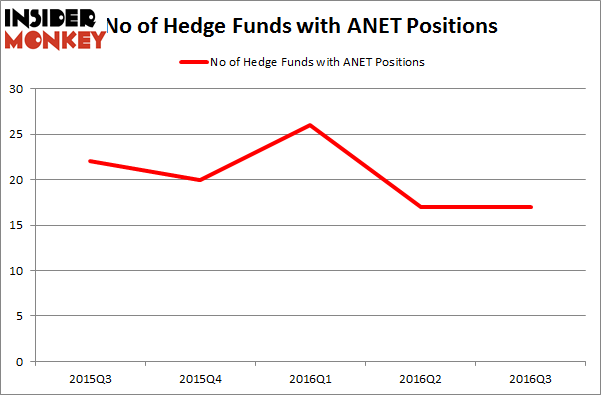 On the other hand, there were a total of 20 hedge funds with a bullish position in ANET at the beginning of this year, with hedge fund ownership of the stock being volatile in the first two quarters of this year. With hedge funds’ positions undergoing their usual ebb and flow, there exists a select group of noteworthy hedge fund managers who were increasing their stakes substantially (or already accumulated large positions). Of the funds tracked by Insider Monkey, Christopher Lord’s Criterion Capital has the biggest position in Arista Networks Inc (NYSE:ANET), worth close to $101.8 million, accounting for 4.1% of its total 13F portfolio. Sitting at the No. 2 spot is McKinley Capital Management, led by Robert B. Gillam, which holds a $33.6 million position; 1.2% of its 13F portfolio is allocated to the company. Remaining professional money managers that hold long positions encompass Jim Simons’ Renaissance Technologies, Brian Ashford-Russell and Tim Woolley’s Polar Capital, and Israel Englander’s Millennium Management. We should note that none of these hedge funds are among our list of the 100 best performing hedge funds which is based on the performance of their 13F long positions in non-microcap stocks. Infosys Ltd ADR (INFY): Are Hedge Funds Right About This Stock? How Big Lots, Inc. (BIG) Stacks Up To Its Peers Has Hedge Fund Ownership in Welltower Inc. (HCN) Finally Bottomed Out? Should You Buy BJ’s Restaurants, Inc. (BJRI)? Biotech Movers: Heat Biologics Inc (HTBX) And Achaogen Inc (AKAO) Is WebMD Health Corp. (WBMD) A Good Stock To Buy?